How Much Radiant Floor Heating Do I Need? Is Radiant Floor Heating Worth It? Sometimes it’s difficult for people to decide how to heat their homes. While it doesn’t always get cold in this area, some winters are absolutely brutal. So when a cold front moves through town, you want a heating unit you can rely on. The most common heaters are natural gas furnaces and electric boilers. These are great tools for keeping your home warm, but they have their drawbacks just like every other style and method of home-heating. Electric boilers take some time to heat up the entire house. Natural gas carries the risk of gas or exhaust leaks. So what are your options if you’re looking for a versatile method of heating your home with minimal to no risk involved? If you’re looking for a new method of heating your home, it may be time to consider the benefits of radiant floor heating. But what is it? How can homeowners consider it if they don’t even know what radiant floor heating is? Can Radiant Floor Heating Heat an Entire House? 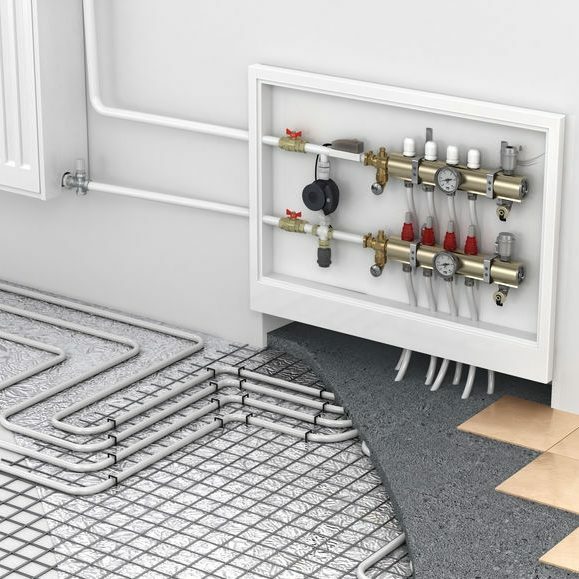 Radiant floor heating is a method of heating buildings completely different from furnaces and boilers that use ducts and pipes to carry heat energy around the home. It’s a method of heating a home from the ground up. It’s a heating system installed underneath your floor material. It is usually installed on top of small insulation pads meant to increase energy efficiency by ensuring the warm air flows up like it’s meant to. It sounds excellent, but can radiant floor heat a house? This method of heating has a lengthy installation process that involves installing your new radiant heating method under your floor. In other words, it can heat any room in your home that has the proper heating material installed in the floor. People often ask “How long does radiant floor heating last?” Normal furnaces last approximately fifteen to twenty years. One of the benefits of radiant floor heating is that it should last over thirty to thirty-five years. That’s approximately twice as long as it’s typical competition. It carries several benefits for homeowners thinking about installing radiant heating. Energy Efficient Most normal furnaces have to get hot enough to push hot air through the ductwork. High-efficiency furnaces heat up to approximately one-hundred and ten degrees to one-hundred and forty degrees Fahrenheit. Radiant floor heating only has to heat the air up to approximately eighty degrees Fahrenheit for it to function properly. The less effort it uses to heat the air, the less energy it uses, the less you have to pay on your electric bill. Most units are also adjustable so that you can choose to heat high-traffic areas and neglect less-used rooms like the guest room. Safe This method of home-heating doesn’t carry any of the same risks as other methods. There’s no natural gas that can leak and impact your health or explode. Space The radiant floor heat system doesn’t have a unit to store somewhere. It leaves all of your floor space available for other uses, like entertaining or storage. Most people ignore the fact that no actual exposed unit also means fewer problems in another way. There’s no way your unit could fail and start making incredibly loud noises. While it’s true the installation raises the floor just slightly, the saved floor space should be more than enough to make up for the issue. Versatile As mentioned previously, it can be manipulated to heat only the high-traffic areas of the home. In addition to this, the control panel is easy to use and located above ground for easy access. It also works with virtually any type of flooring material, but thick concrete floors will increase your electric bill over time. Most people still have questions after this stage in their home-heating systems. For most people it boils down to radiant floor heat cost. Someone usually wants to know “Is radiant floor heat Expensive?” or “What is the difference between radiant floor heat vs baseboard heat?” It’s true, one of the only drawbacks of this method of heating is the initial expense. The materials cost approximately six dollars per square foot, but can cost most to purchase and install depending on if you choose electric or hydronic radiant heat floors. They also warm your home up similar to baseboard heating elements. The primary difference is that radiant floor heating units don’t leave cold spots as they evenly heat a room, and a baseboard doesn’t warm your feet themselves, just the area where your walls touch your floor. Part of the charm of radiant floor heating is that they will warm your home up while keeping your toes feeling warm. You would hire a professional to install your seemless gutters, so do the same if you’re looking at radiant floor heating for your home. 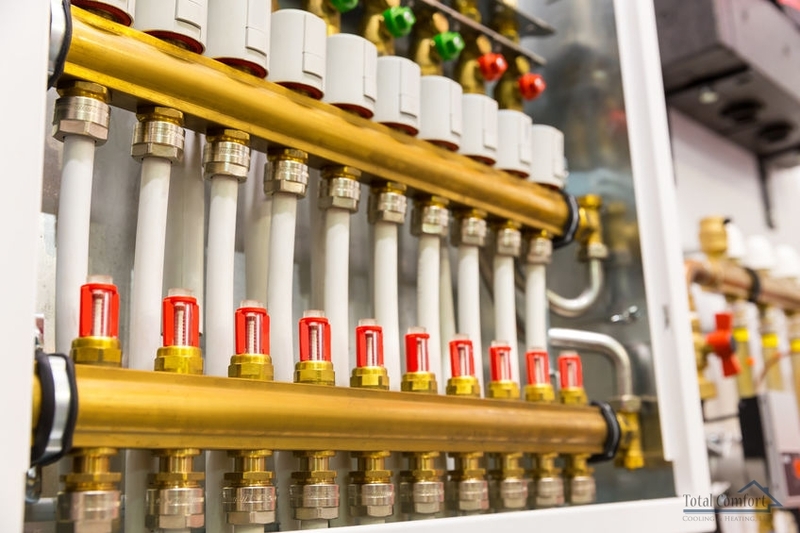 When the time comes for radiant floor heating, you want to make sure you get the proper service to ensure the longevity of your new heating system. So if you’re looking at radiant floor heating for your home in the Macon, GA area, contact the heating and air conditioning experts of Total Comfort Cooling & Heating, LLC at 478-781-9107 for more information today! Posted in Uncategorized on April 15, 2019 at 7:20 pm by Total Comfort.